Begin hiking the Bowl Trail as it makes its way through the lush forest under the Beehive. 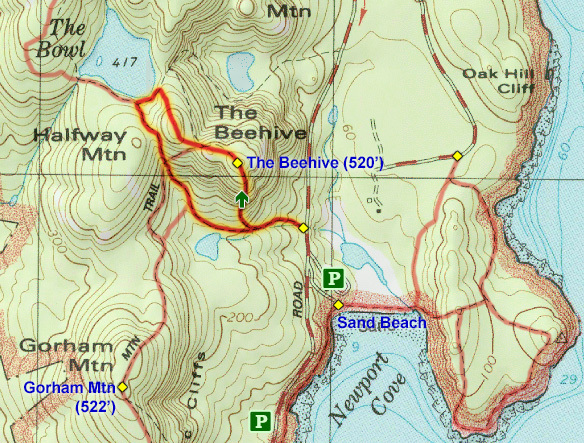 Soon enough you will reach the junction with the Beehive Trail where you will be able to see the imposing peak above. Follow the clever trail as it makes its way to the base of the peak and then works its way up faults and breaks in the granite. 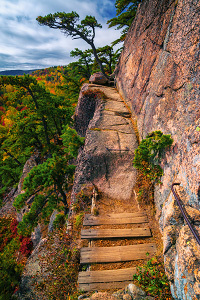 Manufactured steps, iron rung ladders, handrails, and other hardware (including a unique grill plank) help hikers make their way up the peak. While all of the obstacles are reasonable, there is a fair amount of scrambling and the exposure in some sections can be intimidating. If you are a fast hiker, come prepared with patience as many scared people will be taking this route slowly. But soon enough, the mountain relents and you will be standing on top of the Beehive with an incredible view of Sand Beach and the surrounding areas. The summit is a wonderful place to relax and have lunch. Continue down the back side of the Beehive to tag the actual highpoint and get great views of Enoch Mountain and Champlain Mountain to the north. The rest of the hike is much easier as you descend the west side and head towards "The Bowl," a beautiful lake nestled in between the surrounding peaks. The Bowl is a popular place to swim but be warned that leeches like this lake as well. When you have had your fill of the lake, continue back on the Bowl Trail to complete this "lollipop" loop hike. When doing this hike, take note of all of the intersections with connecting trails, including the shortcut trail, the Champlain South Ridge Trail, and the Gorham Mountain Trail. Do not accidentally head towards these other peaks unless you intend to! For those who want to hike to the top of the Beehive without the scrambling and exposure, you can hike up the family-friendly Bowl Trail and come up the back side of the peak. This is an incredible little hike with thrilling rock scrambling and stunning views. 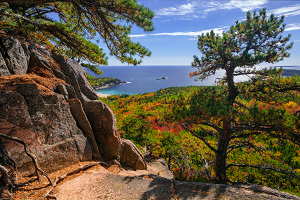 If the exposure and idea of possible crowds doesn't bother you, put this on your list of must-do Acadia hikes!